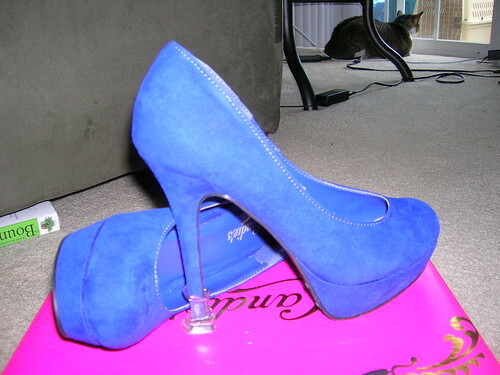 These are my infamous (and fabulous) blue wedding shoes. That’s a five-inch stiletto, folks. Wish me luck. Why to the shoes: because they’re beautiful! Why to the luck: so I don’t fall on my face during the wedding! She’s afraid of either falling and breaking an ankle, or that I’ll lose control and make violent love to her in front of everyone. Take your pick. Ooh, love them!!!! 😀 Good luck!! !